What you see above is called a film holder. 4x5 film comes in sheets in boxes of various number of sheets, usually 10, 20, 50 or 100, depending on your wallet that day. It's not that you just open the box, insert the cannister into the camera, shut the film door, and shoot. You have to load each sheet into the film holder which holds two sheets, one per side, meaning exposing one sheet you remove it, flip it over and insert back to get the second exposure. And this leads to a number of things you must do before you even think about using it. 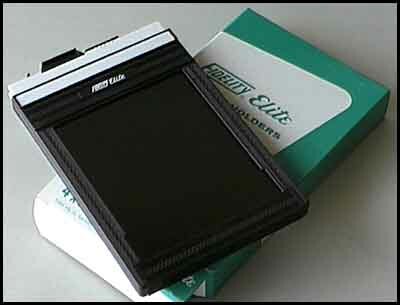 First, you need a bunch of film holders, usually available at professional photo stores. It's a choice if you want new or used, just be careful with used to ensure they're not worn or damaged beyond use. The number you need depends on how often you want to remove and reload them, so a lot doesn't hurt, it's just more work loading them before you go. Ok, you have them and the film. Best bet, read Paul Butzi's Web page on loading film. If you follow the instructions you can't go wrong. The only difference I made was buying a changing tent. It look like a pup tent which you left in the dryer too long. It has two sections, the inner black, light-proof tent and the outer, usually white, tent with zippered flaps to insert everything and two arms for your arms to work inside. The only advantage to a changing tent is you're in daylight instead of total darkness. After that it's simply practice. One suggestion is to use one sheet to practice in daylight to get used to handling film and film holders. And be slow. Speed is not essential, thoroughness is though, otherwise it's all for naught. But you're not done. After that you have to put them in dustproof bags. Remember dust and dirt are the enemies of film, both in the holders and on the film. Most recommend quart size ziplock bags with labels for the film type and speed. Remember to label the film, otherwise you can't remember what you brought! And don't forget to flip the cover to show it's been exposed. The rest? Good luck and enjoy. And take notes on the exposure information, you won't remember it.